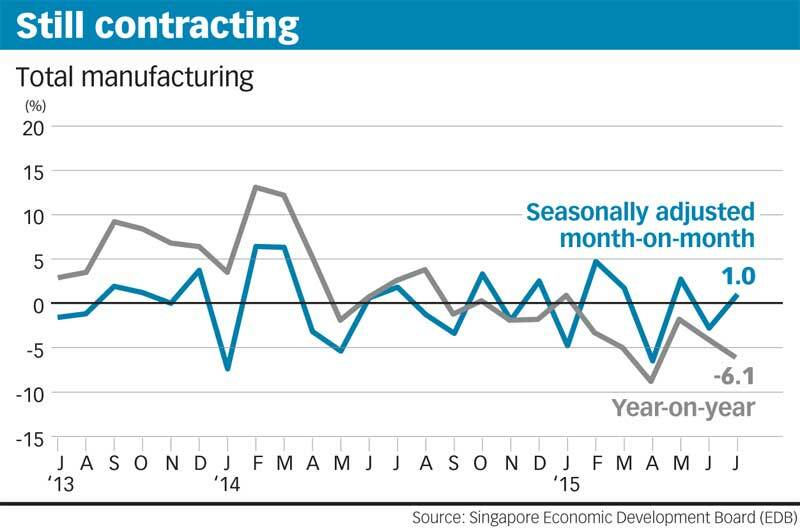 The odds of Singapore entering a technical recession in the third quarter have risen significantly after July's industrial production contracted far more than expected. What this will mean for monetary policy, though, remains unclear - economists have mixed views on whether the central bank will ease its stance come October. Factory output performed dismally last month; it declined 6.1 per cent year-on-year - marking the sixth straight month of contraction - with all clusters save chemicals posting a drop in production. While it may be tempting to blame the sharp fall on the biomedical sector - which posted a double-digit decline of 13.4 per cent in July - the slump was broad-based. Even if the volatile cluster were to be excluded, output would still have fallen, albeit by a smaller 4.1 per cent. The headline figure was much worse than market expectations. Economists polled by Bloomberg before the Economic Development Board (EDB) released the data on Wednesday had been expecting overall industrial production to drop by a lesser magnitude of 4 per cent. Given the disappointing data, most economists agree that the odds of a technical recession - defined as two straight quarters of sequential contraction in GDP - are rising. In fact, one economist, Bank of America Merrill Lynch's Chua Hak Bin, now sees a technical recession as his base case. "Even though it's just one month of data, it's an ugly figure and looking at the way things are going, I don't think August is going to visibly improve. We think there's now more than a 50 per cent chance of a technical recession," Dr Chua told The Business Times. He added in a research note: "We doubt August industrial production will recover significantly, especially given recent weak China PMI (Purchasing Managers' Index) and market conditions. Both the recent Singapore PMI and electronics PMI also reverted to below 50 (in July). Services growth will also likely continue moderating, having eased to 3.4 per cent in Q2 from 4.2 per cent in Q1." The electronics cluster, which retains the largest weight of 33.4 per cent on the industrial production index, stayed in contraction mode in July. Production shrank 5.8 per cent, dragged down by a 12 per cent decline in semiconductor output. Outputs for the transport engineering, precision engineering and general manufacturing clusters were also dismal; dropping 6.1 per cent, 6.2 per cent and 3.2 per cent, respectively. The only bright spot came from the chemicals sector - it grew production by 4.4 per cent, with all segments posting higher output. EDB said the increase was led by the specialties and petroleum segments, which recorded growth of 8.6 per cent and 5.9 per cent respectively. It said that after adjusting for seasonal factors, industrial production increased one per cent in July - which economists called "a small silver lining". If biomedical manufacturing is stripped out, output would have risen 1.2 per cent. Again, the month-on-month growth was worse than private-sector economists had earlier forecast - they had been expecting industrial production to rise 2.3 per cent in July from June on a seasonally adjusted basis. Given the manufacturing sector's paltry showing in July, economists from Credit Suisse, DBS, Mizuho, and OCBC also think a technical recession cannot be ruled out at this point- although it is not their base case. Said DBS economist Irvin Seah: "The July industrial output numbers just rub salt into the wound, given the backdrop of a worsening global economic outlook... Whether the economy eventually dips into a technical recession depends not only on the manufacturing sector. In fact, it is the services sector that is the crux of the issue (and, things) don't look good. The sector already contracted by 1.1 per cent in Q2 (on a quarter-on-quarter seasonally-adjusted annualised basis). This sector has only ever dipped into contraction in times of recession." Barclays's Leong Wai Ho, however, think a technical recession is too early to call, since year-end festive demand should pick up in September. He also noted that a S$3.2 billion idle plant at Jurong Island could be restarting operations soon, which should provide a boost. But if a technical recession were to materialise in Q3, economists are divided on what that would mean for monetary policy. Some believe the Monetary Authority of Singapore (MAS) will ease to boost exports, while others say a severe deterioration of the labour market would first need to occur before such a move would make sense. Said Credit Suisse economist Michael Wan: "The risk of a technical recession is certainly quite high now, but I don't think that in itself will be enough to prompt a policy change from the central bank. I think the focus for the government has shifted a lot away from just the headline GDP growth number, to making sure that growth is sustainable and inclusive. "So a growth print below say 2 per cent would be low, relative to history. But as long as the labour market is still doing okay, I don't think (MAS) will necessarily be perturbed.